WARNING: This is just an experiment, it is not meant for public distribution yet. Also, this tool disables a number of features, including of Microsoft Office, Adobe Reader, and Windows, that might cause malfunctions to certain applications. Use this at your own risk. 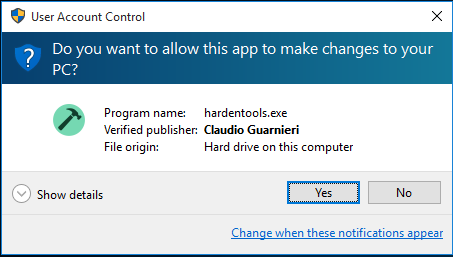 In case you wish to restore the default settings and revert the changes Hardentools made (for example, if you need to use cmd.exe), you can simply re-run the tool and instead of an "Harden" button you will be prompted with a "Restore" button. Similarly, click it and wait for the modifications to be reverted. In the future, we will create the ability to select or deselect certain modifications Hardentools is configured to make. It does NOT prevent software from being exploited. It does NOT prevent the abuse of every available risky feature. Disabling AutoRun and AutoPlay. Disables AutoRun / AutoPlay for all devices. For example, this should prevent applicatons from automatically executing when you plug a USB stick into your computer. Disables powershell.exe, powershell_ise.exe and cmd.exe execution via Windows Explorer. You will not be able to use the terminal and it should prevent the use of PowerShell by malicious code trying to infect the system. Sets User Account Control (UAC) to always ask for permission (even on configuration changes only) and to use "secure desktop". Disable file extensions mainly used for malicious purposes. Disables the ".hta", ".js", ".JSE", ".WSH", ".WSF", ".scr", ".vbs" and ".pif" file extensions for the current user (and for system wide defaults, which is only relevant for newly created users). Disable Macros. Macros are at times used by Microsoft Office users to script and automate certain activities, especially calculations with Microsoft Excel. However, macros are currently a security plague, and they are widely used as a vehicle for compromise. With Hardentools, macros are disabled and the "Enable this Content" notification is disabled too, to prevent users from being tricked. Disable OLE object execution. Microsoft Office applications are able to embed so called "OLE objects" and execute them, at times also automatically (for example through PowerPoint animations). Windows executables, such as spyware, can also be embedded and executed as an object. This is also a security disaster which we observed used time and time again, particularly in attacks against activists in repressed regions. Hardentools entirely disables this functionality. Disabling ActiveX. Disables ActiveX Controls for all Office applications. Disable execution of objects embedded in PDF documents. Acrobat Reader also allows to execute embedded objects by opening them. 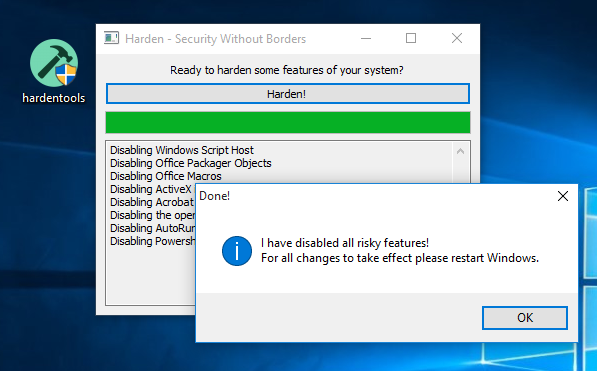 This would normally raise a security alert, but given that legitimate uses of this are rare and limited, Hardentools disables this. This tools is developed by Claudio Guarnieri, Mariano Graziano and Florian Probst.